Kami Glass is in love with someone she’s never met – a boy the rest of the world is convinced is imaginary. This has made her an outsider in the sleepy English town of Sorry-in-the-Vale, but she doesn’t complain. She runs the school newspaper and keeps to herself for the most part – until disturbing events begin to happen. There has been screaming in the woods and the dark, abandoned manor on the hill overlooking the town has lit up for the first time in 10 years. The Lynburn family, who ruled the town a generation ago and who all left without warning, have returned. As Kami starts to investigate for the paper, she finds out that the town she has loved all her life is hiding a multitude of secrets- and a murderer- and the key to it all just might be the boy in her head. The boy who everyone thought was imaginary may be real…and he may be dangerous. Why did I read this book: I absolutely adore Sarah Rees Brennan’s books and am an unabashed fangirl. Of course I would read this most recent offering. Kami Glass is a regular teenager with close friends, a loving family and a good life in the sleepy town of Sorry-in-the-Vale. Well, not quite regular: there is a distinctive characteristic about Kami that sets her apart – she has an imaginary friend called Jared, a boy she’s talked to in her head ever since she can remember. Jared has been her constant companion, her closest confidant and the one person who knows everything about her. Kami knows she has made him up and most people have grown used to the odd moment when she gets caught apparently talking to herself. Although some people might think she is crazy. Beyond that, Kami wants to be an investigative journalist and is in the process of setting up a school newspaper as the book opens. Her first stories are about Sorry-in-the-Vale, the town in the Cotswolds (England) where she lives. Most importantly, she is set to investigate the mysterious Lynburn family, owners of the manor that has overlooked the town for centuries as well as the sinister deeds happening in the woods around the town. The impetus for investigating the Lynburns comes from the fact that everybody in town talks about them and their connection to Sorry-in-the-Vale. They are part of the town’s folklore and inspire both awe and fear. Kami, with her inquisitive mind wants to know why and how this connection has come to be, especially now that the Lynburns are finally back in town. And who could be more approachable than the two teenage Lynburns, the cousins Ash and… Jared. Who turns out to be her very not-at-all imaginary friend Jared – he is real: a young man, with a difficult family life, abused by his mother, amongst the mysterious Lynburns , someone who has also always thought he had made up his imaginary friend Kami – whom he sees as a blessing. Now that the two have finally come to meet, how can they address this awkwardness? And what does that have to do with the mysterious happenings around Sorry-in-the-Vale? A new Sarah Rees Brennan is always reason for celebration here at Casa de Smugglers. 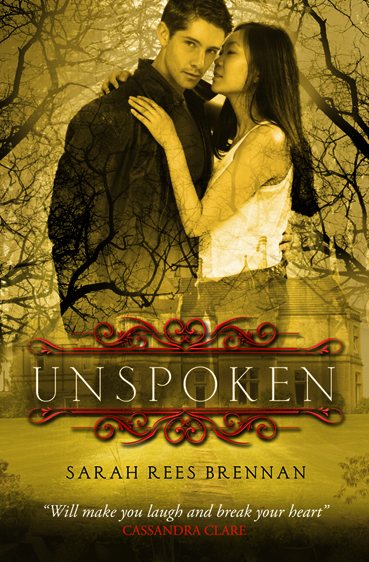 Unspoken is her new book, the first in a promising new Gothic/PNR YA series. It has all the elements I have come to expect from a SRB book: strong female characters, interesting paranormal elements, diversity in terms of race and sexual identity in the presentation of its characters (Kami is half-Japanese for example; one of her friends is LGBT) and a sense of humour and wit that makes almost every page extremely funny. This book is kind of like the child of her Demon’s Lexicon trilogy and Team Human and it has great potential to be even better than the previous ones. I loved its strong gothic elements (the mysterious manor house with the mysterious family that runs it) as well as its Paranormal Romance elements. The most striking thing about Unspoken though is its combination of the utterly familiar and the clearly distinct. In many ways Unspoken is just like most Paranormal YA out there. There is a familiarity in the way that the story progresses; in the inclusion of a Love Triangle of Doom; and in the deep, unexplained connection between its two main characters Kami and Jared. 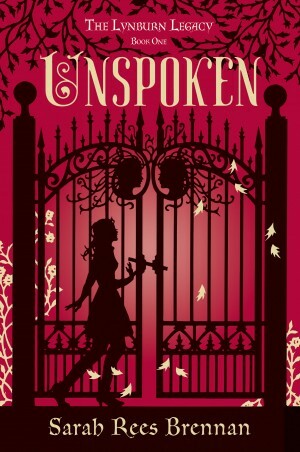 But Unspoken is also unlike most of the usual PNR YA fare in the way that it breaks certain moulds, expands on them and explores the idea of love and connection in different ways. In a sub-genre obsessed with insta-love and deeply disturbing connections between young lovers, this book is a breath of fresh air that turns the idea of “deep-seated bond” on its head. Jared and Kami have known and loved each other all their lives but each really thought the other to be imaginary. When they meet in real life, they realise that this is surprising, awkward, scary, exhilarating as well as unpleasant. There is a great exploration of how utterly, completely creepy and problematic this type of connection is at the same time that it acknowledges the sense of comfort and the bond that it can inevitably engender. It is a difficult situation for all of the involved especially when Kami starts to consider that her emotions might not be her own, that being so deeply connected to Jared can never possibly be healthy – even if they are just friends (for now). They were unable to even touch each other without getting the creeps. In a sense, this is the most unromantic romance ever – and it is meant to be that way. Whilst this is probably the biggest emotional pull of Unspoken, it is not one that overwhelms or compromises the rest of plot in any way. Kami deals with Jared at the same time that she is generally awesome with her family and friends and progresses with the investigation of the Lynburns and the secrets surrounding their lives. I loved the relationship between Kami and her best friend Angela and how it developed to include and welcome a third girl, Holly, in the group – the three are very different girls and each has a defined strong personality and I adored every single one of them. On a more personal note: I read a few reviews on Goodreads and noticed the strong reactions about the ending (and many reviewers/readers call it a cliff-hanger). This is really interesting to me as I did not see the ending as a cliff-hanger at all. It was not even surprising to me: it was not only perfectly foreshadowed but also, expected. It was the natural development of this story, without which there could be absolutely no hope for a healthy emotional life for Kami – and I am ALL for a healthy, emotional life for Kami. I am really interested to see how this story will progress over the course of this series – I am totally onboard for that. Every town in England has a story. One day I am going to find out Sorry-¬in-¬the-¬Vale’s. The closest this reporter has come to getting our town’s scoop is when I asked Mr. Roger Stearn (age seventy-¬six but young at heart) to tell me a secret about our town. He confided that he believed the secret to Sorry-¬in-¬the-¬Vale’s high yield of wool was in the sheep feed. I think I may have betrayed some slight disappointment, because he stared at me for a while, said, “Respect the sheep, young lady,” and ended the interview. Which leaves us with a town in the Cotswolds that has a lot of wool and no secrets. Which is plainly ridiculous. Sorry-¬in-¬the-¬Vale’s records date back to the 1400s. Six hundred years do not go by without someone doing something ¬nefarious. The Lynburns are the town’s founding family, and we all know what the lords of the manor get up to. Ravishing the peasants, burning their humble cottages. Fox hunting. The list goes on and on. The song even talks about secrets. During this dauntless reporter’s lifetime, however, the only Lynburn in Aurimere House was Marigold Lynburn (now deceased). Far be it from me to speak ill of the dead, but it cannot be denied that Mrs. Lynburn was a ferociously private person. To the point of ferociously throwing her walker at certain innocently curious children. Additional Thoughts: SRB is blogging with us today talking about Inspirations & Influences behind Unspoken – movies, TV shows and books. Plus, we are giving away two copies of the book! Go forth and have fun. I love this review. I couldn’t agree more and I loved this book. It’s everything I wish all YA paranormals would be but never are. I really appreciate the author for trying to do something different an original. There is a familiarity in the way that the story progresses; in the inclusion of a Love Triangle of Doom; and in the deep, unexplained connection between its two main characters Kami and Jared. I was one of those readers who complained about the ending. I think something like the ending was foreshadowed, particularly in the last third of the book which I found to be the weakest part of the story. Brennan has a strong voice which is great because it helps to power over the predictability, but in the end, the trope of the Love Triangle of Doom triumphed over voice and resulted in what I felt was tiresome melodrama. That said, I think my tether of tolerance for these types of overarching relationship plots has become shorter and shorter and if I had read the book five years ago, my response may have been completely different. spoilers! BEWARE SPOILERS FOR THE BOOK! @ Jane- but Jane, do you really think there is an actual Love Triangle in the end? I mean, it starts with the possibility of one but I think by the time the ending rolls, I think Jared has been established as the One True Love? I might be wrong, I might be surprised in the second book but I think this is where the story is going. What I meant by “not-a-cliffhanger” was the way not only their connection was severed but also the way Jared reacted – the way his arc progressed foreshadowed that very reaction – he could not have reacted any other way (given his dependence on Kami) and yes, it is VERY melodramatic but it fits the Gothic genre. That said, my theter of tolerance is pretty high when it comes to Brennan’s books. I completely trust her to take this story to a good place. I would probably slobber if I have to say how much I want this book. So glad it will debut soon here in the States. @Ana – I haven’t read Brennan before. This is my first time so alas I don’t have the confidence you have. But the other point, regarding the Love Triangle of Doom – only serves to heighten my dislike of the Love Triangle. If one party is so obviously the love interest and the cliffhanger ending is so ridiculous patently a false lead, then what is the point of either the cliffhanger or the love triangle? To me, without establishing the purpose of either, I am struck with a sense of overt manipulation. @ Jane – what is the point of any love triangle here? That said, I don’t see the ending as a false lead, I see it as a hurdle which they will have to overcome before they get together. Or not. That’s just how I am reading it. Great review, this was my first read by this author, and I had mixed feelings about it. Overall I enjoyed it and hope a second novel is in the works. I love everything SRB writes, but I had real mixed feelings about this one. The ending bothered me a LOT, but not because of the Love Triangle of Doom (must use this phrase ten times today!) but because of the climactic scene in the quarry. I thought that the revelation of the Big Bad, his motivations, and very much especially the reactions of the rest of the Lynburn family made sense *only* if you read them as expies of certain fanfiction versions of villainous Harry Potter characters. I struggle with SRB, in that her books always sound like they’re going to be good, and I get sucked in and buy them, and then, nope, I just cannot stand the prose. Even with Team Human, which I know was a joint effort. The writing style just isn’t for me, I guess.